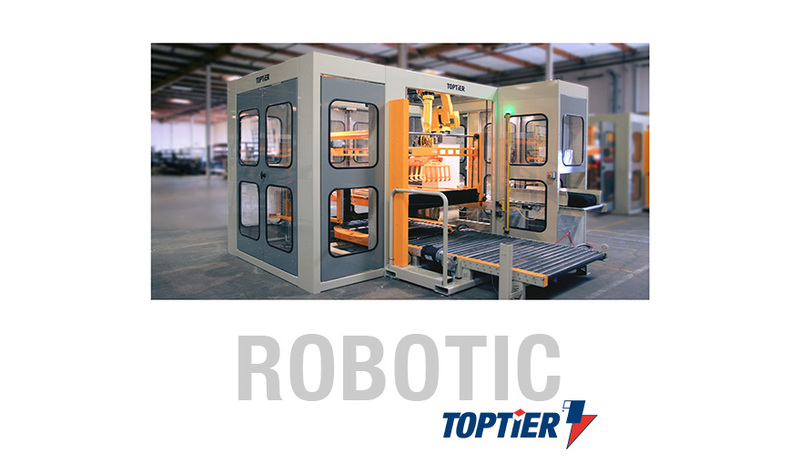 RoboTier provides advanced capabilities and performance — with no robot programming. Robot palletizing has become an increasingly accepted alternative to traditional layer palletizing, but the solution is not without challenges. Typical robot palletizing experiences limits on products that can be handled, performance issues with deviations in product uniformity, special training to handle complexities of robot programming, large footprint, custom integration, and the expense of support. All these shortcomings are eliminated with RoboTier. RoboTier utilizes end of arm tooling that supports product from the bottom, allowing higher speed robot motion and advanced product handling security. Bottom support offers a significant improvement over typical robot product handling methods such as vacuum top picking that is less flexible and secure, and clamping systems that necessitate looser loads. Bottom support is achieved by assembling layers on an apron with products loosely spread to allow removal of the bottom support tool. Loose spreading allows faster robot speeds, as exact product placement is not critical. Once a layer is completed, four-sided clamping centers the layer on the pallet and a tight uniform layer is deposited. Vertical travel capabilities of the apron reduce robot reach requirements allowing use of the smaller, faster, and more economical Fanuc robots. The layer apron also provides a queuing platform for continued layer building while optional concurrent stretch wrapping occurs. 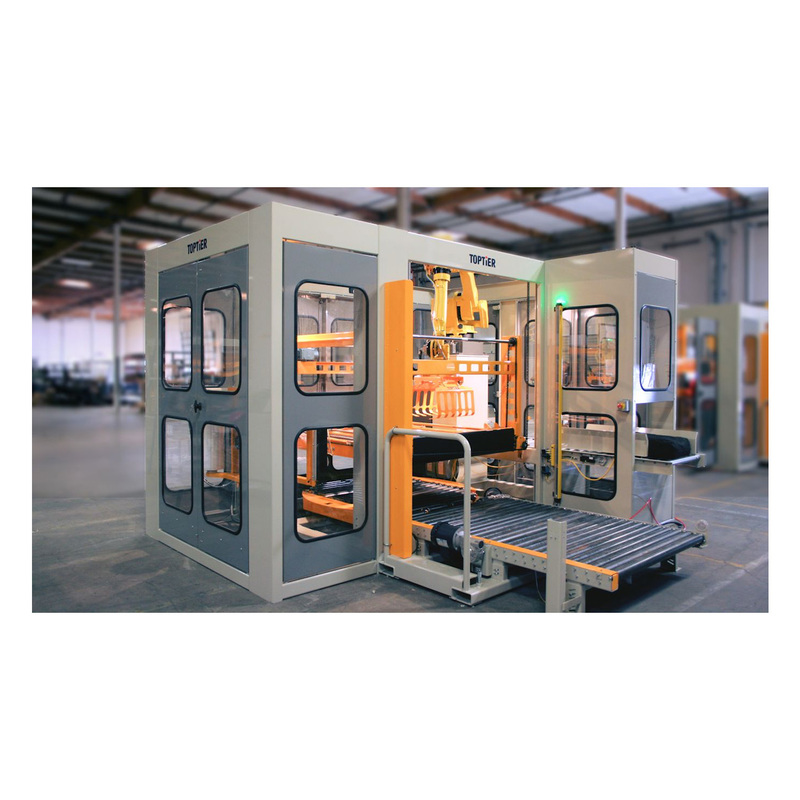 Safety has been integrated into every aspect of the RoboTier design to meet all industry standards utilizing a category 3 safety cage frame design with light curtain protection of load exit, redundant hoist fall protection, controlled entrance protocols, and Fanuc safety systems. Additional safety information.. Pick and place multiple products to a layer head or directly to the pallet where PerfectPattern system pre-orientates products for robot pick and place. Less than full rows, full rows, or complete layers can be handled. TopTier palletizers can build any pallet pattern, with up to 99 patterns stored and instantly accessible. End users can easily create new patterns using the HMI touch screen common to both conventional and robotic models.